Most of them took up way too much Council time, a total of 8 minutes for each was extended for most of them. 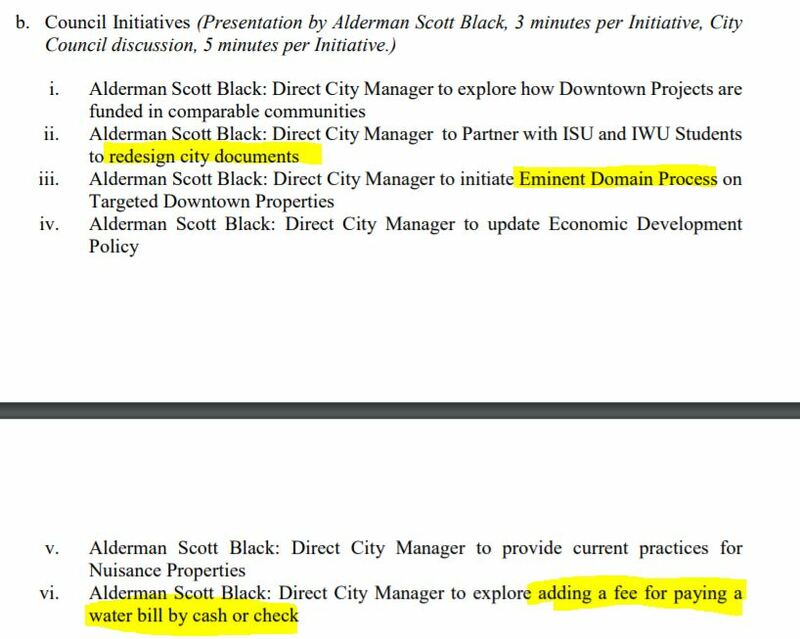 Scott doesn’t really want to know how other communities fund downtown redevelopment, he wants new fees or taxes that are designated just for downtown. He thinks the weekend downtown partakers will pay more for a beer. He’s not interested in budgeting items, he wants progress now. The documents redesign seemed to concentrate on council docs. He doesn’t think they are high-tech enough. A frequent comment by other Council members was that staff should be able to chime in! Have they got time for interns? Some of the Council members were afraid to discuss this one in public. They felt some property owners might feel targeted. They are, we all know which ones. The Council thinks property items must be discussed in secret (Executive Sessions). The law says they can, not that they must. Not really discussed since it’s already being worked on for presentation soon by staff. The Council is completely possessed by downtown. The rest of the City is immaterial. I hope good people will step up to replace them. If you feel like wasting at least an hour, just hit play. You might want a pot of coffee within reach however. Posted in BloNo, Bloomington, BLOOMINGTON CITY COUNCIL, budgets, downtown hotel, elections, Local, Progressives, Renner, Taxes, Tim Gleason.Tagged Alderman Scott Black, council inititives, eminent domain, Green Top failing. We need smart people… we have low IQ unimaginative people…. and the result is…. silly clueless leadership that is driving our cities off cliffs from which we will never recover from. They are a reflection of the people who bother to vote. Since few do – this is what you get. Exactly…and you get this pack of incompetent clowns mucking around like a bunch of 7th graders at a holiday jamboree! Scott really is out of touch with his constiuents. So very out of touch. I wonder if those who vote for him (lots of senior citizens who still pay their water bills by mailing a check in) are aware of the kind of complete garbage he wastes time on. He does not get it. He exists in an echo chamber and has no idea what the individuals in his ward care about. Glad to hear Green Top is failing! The self-righteous elitists just got slapped down by the reality of the market. Demand can’t be created out of thin air. The market determines the “right fit” not establishment politicians, their cronies, and pressure groups. Of course, Tari & Co. won’t learn their lesson. By the way, weren’t we told Green Top was a solution to a “food desert”? It’s so nice of the “compassionate” progressives to use the poor in order to open a members-only club for upper-income white people. That is exactly what they did! They used the “food desert” narrative to create a food club for the upper income, upper class town elites. Now they have the exciting job of begging for $400,000 by fall or close their doors. Isn’t fall right around the corner? Who in their right mind is going to pony up money to an operation that is obviously not going to be able to survive for more than another 6 months? Playing the lottery would make more sense… at least their is a remote chance you could win something. I am glad that the Green Top was the right fit for Crazy Tari’s master plan for the new and improved Bloomington. A “food desert” my, my, my, But our almighty mr Renner ASSURED us that Green Top would be a tourist destination and that people would come here to shop there, and we’d ALL be happy and life wouldn’t get any better.. And what about those POOR stockholders-YEP holding the bag! Scott Black must have his brain at the shop or something, as those ideals (IF you want to call them that) are ALL so far out of touch with the REALITY of this city that it’s just dumbfounding! Hopefully the shop gets it fixed.. I watched Snotty talk for just a few minutes in the video…. OMG! That boy is full of himself…. and if he is smart he is not showing it very well. He appears to be full of something else… but then what do I know?